You can use the outline you traced on one of the four embedded layers and create invisible strokes to paint your drawings on separate layers, this provides more inking and painting flexibility. 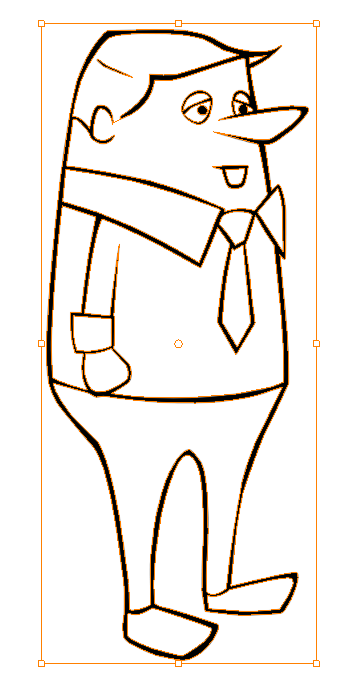 To do so, you must use the Create Colour Art from Line Art option. You can also configure the option to create the invisible strokes on any of the four embedded layers. 2. In the Camera or Drawing view, select the artwork to transfer to the Colour Art. 3. In the Drawing View toolbar, click on the Create Colour Art from Line Art button or press [*]. 2. In the Tool Properties view, hold down the [Shift] key and click on the Create Colour Art from Line Art button to open the Configure Line Art to Colour Art dialog box and modify the default settings of this command. The Configure Line Art to Colour Art dialog box opens. 3. 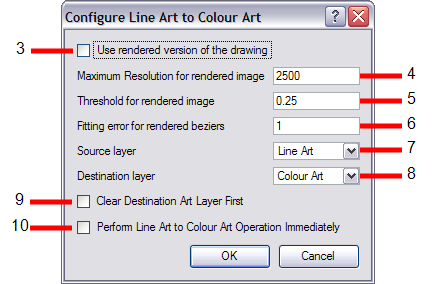 Use rendered version of the drawing: This option will render the drawing and vectorize it to calculate the position of the centreline that will produce the colour art stroke. 4. Maximum Resolution for rendered image: This is the size of the rendered image. 5. Threshold for rendered image: The value of grey processed to create the rendered vectorized arts. 6. Fitting error for generated Beziers: This value represents how precise the fitting of the colour art zone in relation of the line art will be. 7. Source Layer: In the Source Layer drop-down menu, select the layer (Line Art, Colour Art, Underlay or Overlay) you want the strokes to be created from. 8. Destination Layer: In the Destination Layer drop-down menu, select the layer (Line Art, Colour Art, Underlay or Overlay) you want the strokes to be created on. 9. Clear Destination Art Layer First: If you already have artwork on the destination layer and you want the content to be deleted before the strokes are added into it, enable this option. 10. Perform Line Art to Colour Art Operation Immediately: Enable this check box to perform the Create Colour Art from Line Art command when you click on the OK button of this window.